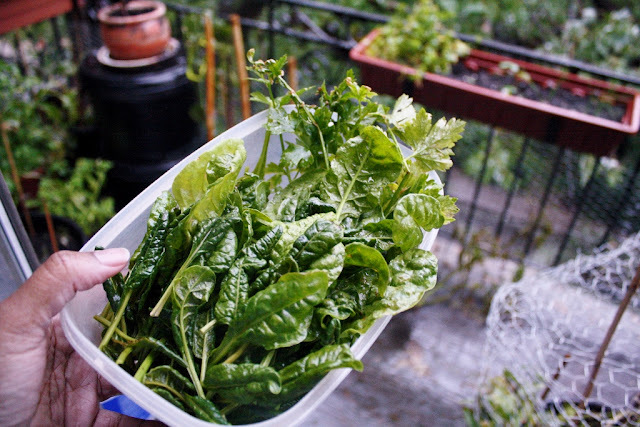 i recently used up the last of this Summer's chard and cutting celery in a very Autumnal pot of barley soup, signaling the official change of seasons here at la maison gnu. now we get to look forward to the varying degrees of coldness that come between September and next April May June. i tend to think of it as my punishment for falling for a Canadian. 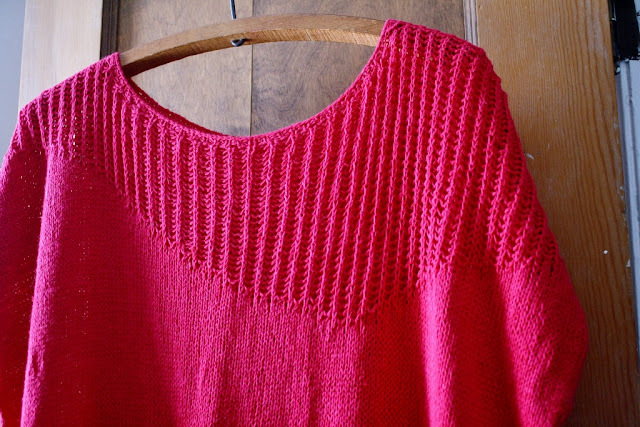 luckily, i have an impressive list of Fall-Winter knits to tackle in the coming months, and i am looking (especially) forward to ending what has become a disturbing trend in my crafting life. i was perusing some photos of recently completed knitting projects, when it first caught my attention. do you see it? not being one for resolutions, i began the year with a solemn promise to put my fiber stash to better use by making stuff for myself that i might actually wear... instead of just shoving them into the wardrobe, only to pull them out once or twice a year to be admired briefly before being returned to the pile of unworn hand-knits i keep hidden from sunlight at the back of my wardrobe. the first step in this endeavor was the purchase of more wool-free yarns that i could keep next to my skin for more than a few minutes at a time. as most fiber-folks would agree, when trying to use up one's stash, the first step is to buy more yarn... naturally. turns out that there is a wide world of cotton and linen yarns that make for awesome year-round wearing. sold! armed with this powerful revelation, i set out to make myself a comfy top or two for the warmer months. that is when things got weird. 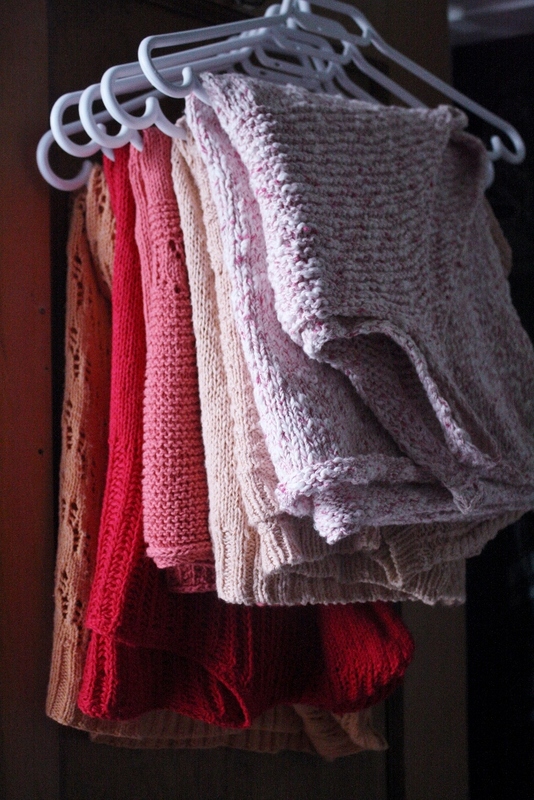 the garment at the left/back of this stack is last year's orange sherbet cardi, but the other four garments are from this Summer. i included the cardi in the lineup, as it seems to fit in with the disturbing theme. 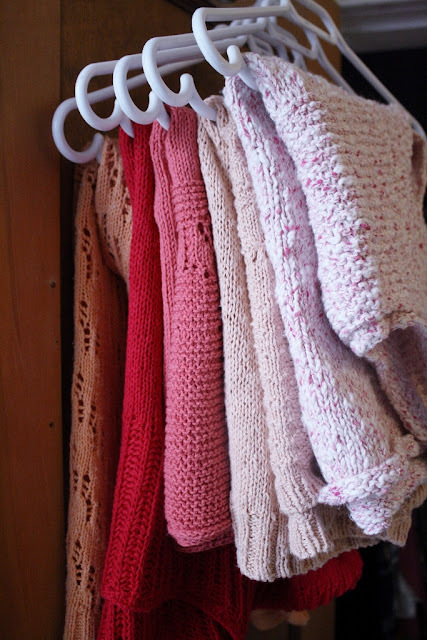 when you look at them, hanging there all together like that, one cannot help but think, wow... that is an awful lot of pink... which is odd, as i do not like pink. my clothing life is usually dominated by many shades of white, black, and grey. navy blue is my idea of colorful attire. seriously. i might occasionally venture into turquoise or Mediterranean Blue if i am feeling particularly adventurous, but there is usually alcohol involved at that point. why then is it that all of my attempts at comfortable, warm weather clothing for self seem to converge on varying shades of pink? i plan to spend this week exploring this phenomenon, before (hopefully) returning to more familiar territory. i bought some absurdly pricey yarn last year, and i was living in constant fear of ruining any of it. no exaggeration... i was so intimidated by how much this stuff cost, that i could not bring myself to store it away with the rest of my stash, so it lived, nestled with great care, at the back of the dresser drawer where i keep my underwear. true story. 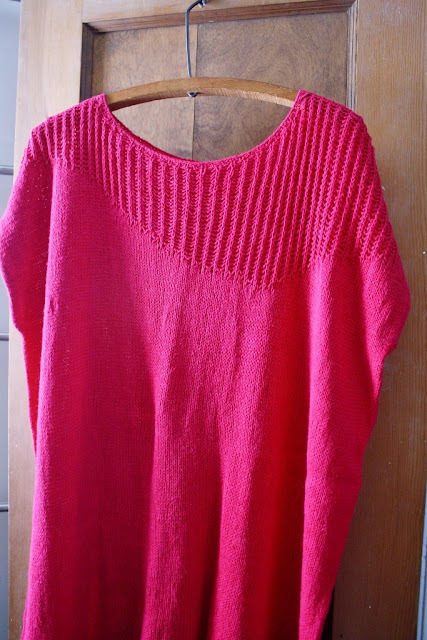 i am still far too intimidated to touch the green silk stuff, but i managed to pluck up the courage to turn the fuchsia cotton/linen yarn into a Linum Tee (by Bristol Ivy). 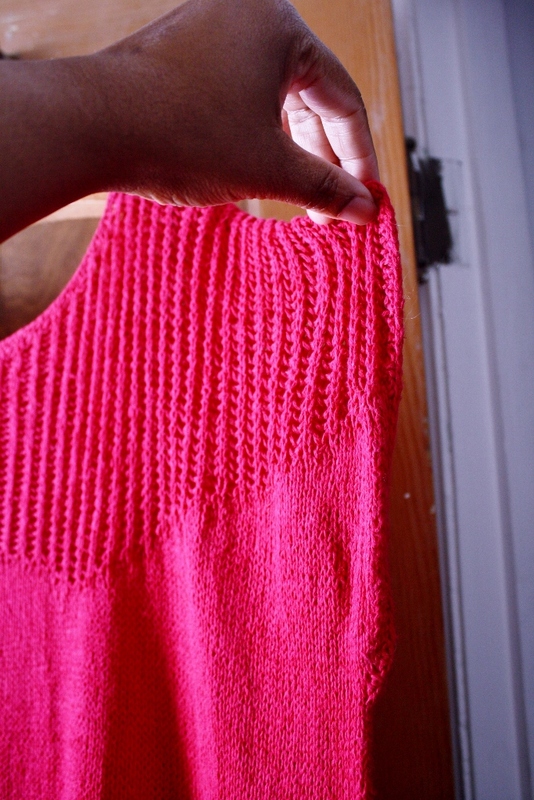 i made mine a couple-few inches longer than the pattern suggests, as i wanted it to be more tunic-y-ish-esqe-like. it is a relatively simple top whose main feature presented an intense challenge to my particular brand of OCD. do you see the asymmetry in that top section? scary! i was not crazy about the unfinished edge on the armhole, but it is growing on me... i think. it looks red, but the color is actually an intense fuchsia that almost glows in sunlight. what was i possibly thinking??? 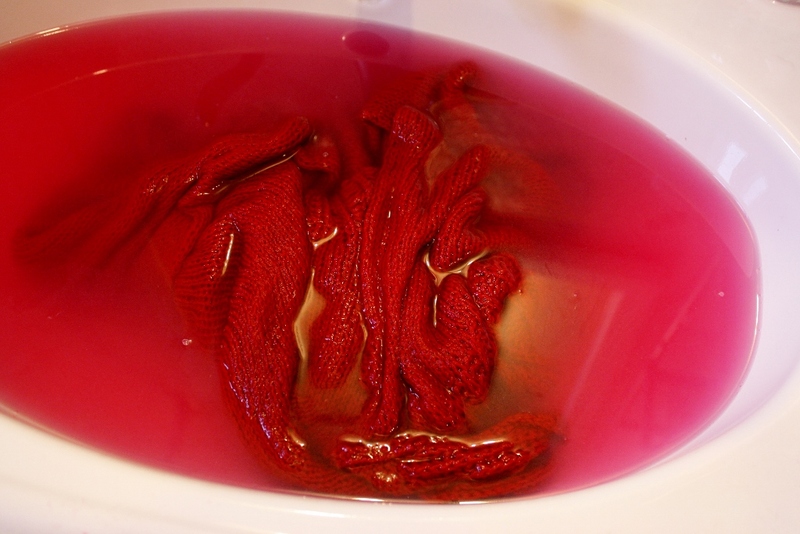 the dye on this yarn bled like crazy when i washed the top. 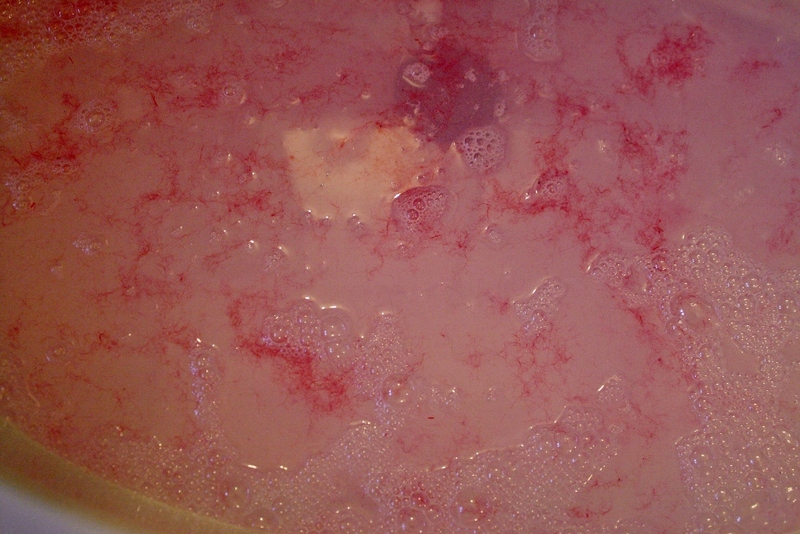 there were lots of tiny bits of fiber fluff left floating in the water... and this was the third rinse! this is definitely going to be a hand-wash-only item. 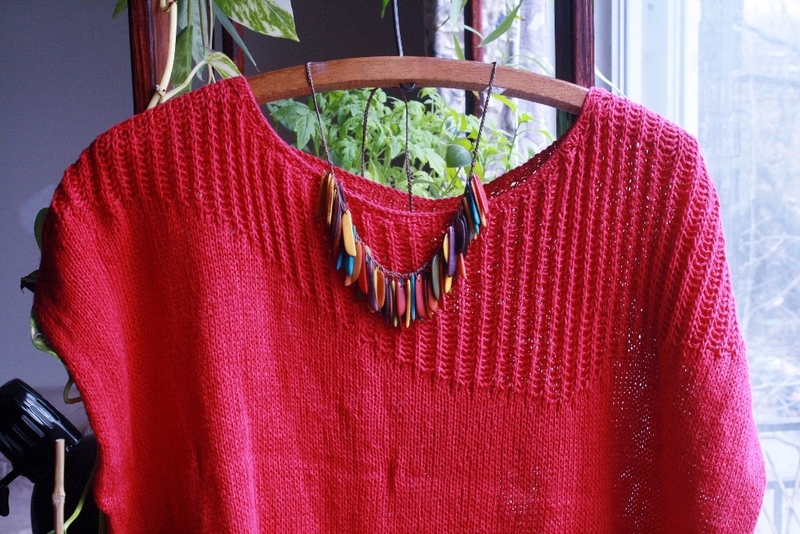 i even took the time to photograph it with the colorful necklace i bought at a little shop in the neighborhood. throw in a white skirt, low-slung belt, and some sandals, and that is a seriously cute combo... if i ever talk myself into actually wearing it out in public. maybe next Summer. tomorrow we will take a look at the top that time forgot... literally. i am going to break my "no serious topics" rule just this once to mention that my mom called me this morning from her office. it is the same strange exchange we have shared on this day for each of the past sixteen years. she works for a company that had their offices halfway up the north tower of the World Trade Center... and, yes, she was there that day. [she was also there back in ninety-three, when i stood inside my high school, a few blocks away, while helicopters came and went, using the empty lot across the street from our building as a landing zone]. there were no 9/11 casualties among her coworkers, but they were in the process of merging with another company that lost twenty employees on that day, so they hold a memorial service each year in honor of those individuals. it was several hours before we knew that my mom was safe, and it is impossible to acknowledge this date on the calendar without revisiting some part of that feeling of complete and utter dread. my heart goes out to anyone who was there, and especially to the families who did not get the phone call that my own family was so relieved to eventually receive that day. i was especially proud of my city in the aftermath of that tragedy. we shed our reputation of unkindness and indifference, and reached out to support each other in so many wonderful ways. we strove to be our best selves in the face of despair, and that is what i try most of all to focus on when this day rolls around each year.